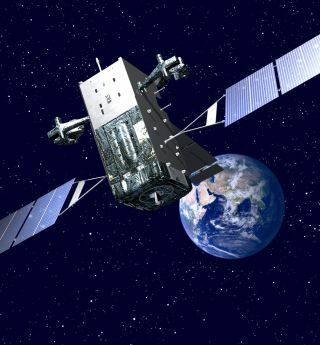 An artist's illustration of a Lockheed Martin-built Space Based Infrared System Geosynchronous (SBIRS) missile warning satellite for the U.S. military in orbit. SAN FRANCISCO — The U.S. Defense Department’s $527 billion spending blueprint for 2014 would leave the majority of unclassified space programs intact with the exception of proposed satellite systems for missile tracking and space surveillance, both of which are getting the ax, budget documents show. If approved by Congress, the plan, which includes $52 billion more than the Defense Department is authorized to receive as a result of across-the-board federal spending cuts, would provide a total of $8 billion for military space programs in 2014, a level consistent with 2013 expenditures. Under the Budget Control Act of 2011, Pentagon spending would be capped at $475 billion in 2014. The 2014 budget blueprint sidesteps that cap by floating an alternative deficit reduction plan from President Barack Obama. If Congress rejects the plan and the Defense Department is forced to cut spending quickly, equipment modernization and military readiness would suffer, Defense Secretary Chuck Hagel told reporters April 10, according to a transcript of the briefing. Nevertheless, additional budget cuts appear likely, said Josh Hartman, chief executive of Horizon Strategies Group in Washington. “This budget is just a starting point for more cuts, not just to space programs but across the board,” Hartman said, adding that over the next five years, defense spending is likely to drop 20 percent. Still, the Obama administration is not alone in proceeding as though dramatic reductions in military spending can be avoided. In March, both the U.S. House of Representatives and U.S. Senate passed resolutions setting 2014 defense spending levels at $560 billion and $552 billion, respectively. “No one is acting like the defense budget will be cut,” Thompson said. The budget plan cancels the U.S. Missile Defense Agency’s planned Precision Tracking Space System (PTSS), a constellation of missile tracking satellites that received $242 million in 2013. Previous plans called for funding that effort at the $268 million level in 2014. The Pentagon expects to save nearly $2 billion over the next five years by canceling the PTSS program, budget documents show. The Pentagon’s 2014 budget proposal includes $403 million for the Space Fence upgrade, an effort to establish new land-based radars to track and identify objects in orbit. However, Gen. William Shelton, commander of Air Force Space Command, told reporters April 9 that the pending contract award for the Space Fence upgrade could be deferred indefinitely due to budget pressures. — $58 million for an extensive campaign to upgrade the Joint Space Operations Center at Vandenberg Air Force Base, Calif., where Air Force officials monitor satellite operations and launch activities. — $13 million for the Space Test Program, which finds rides into orbit for military science and technology payloads, but no money for Operationally Responsive Space, which is designed to field space capabilities quickly in response to emerging military needs. The Air Force proposed ending these programs in its 2013 request, but lawmakers rejected the idea and funded both. — $59 million to continue research, development and procurement of the various components of the U.S. Navy’s Mobile User Objective System, a constellation of satellites and ground stations designed to provide U.S. and allied forces with secure, cellphone-like communications. — $1.9 billion to purchase five EELV rockets. — $936 million for the Space Based Infrared System program satellites, funding that will support procurement of two new geosynchronous missile warning satellites. — Nearly $1.3 billion for the GPS positioning, navigation and timing satellite program, including procurement of two more satellites and funding for the associated ground system, or operational control segment. — $652.5 million to purchase two Advanced Extremely High Frequency satellites and fund research aimed at replacing obsolete satellite components and inserting newer technology, according to Pentagon budget documents. — $52.3 million for the Air Force’s Wideband Global Satcom program, which will support procurement of two new satellites while funding studies of ways to make the communications constellation more efficient. This story was provided by Space News, dedicated to covering all aspects of the space industry.